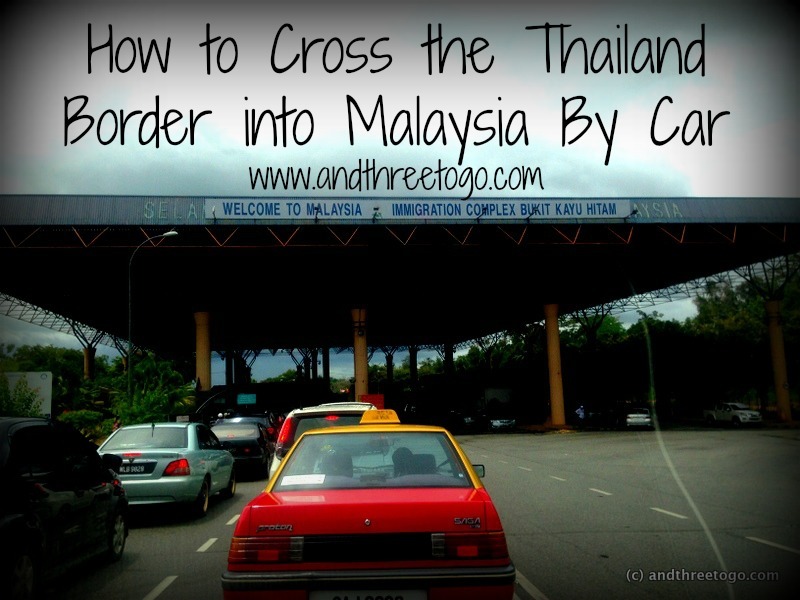 This is a handy guide for how to cross the border fromThailand into Malaysia by auto via the Sadao checkpoint in Danok,Thailand. Make sure to get about 100 Malaysian Ringitt at a bank, there is no where to get it until far after the border crossing and you will need it at the border to Malaysia. We researched that darkly tinted car windows (those that block over 50% of the light) are illegal. So we had all the tint removed from our vehicles windows before we left. We did not want to take the chance on our trip that they would make us remove the tint ourselves at the border. After saying that though, we did see many cars (mostly Malaysian) with some pretty serious tinted windows. These tips are for cars owned by you and registered in Thailand. You cannot cross the border in a rented car. Cars that are registered in other countries will have to follow extra steps, this was helpful in knowing what that would entail. When you arrive in Sadao (via the AH2 Highway), the road will be suddenly diverted to the left by some road barriers. Continue on through the loop without stopping (I think that this must be a place for trucks transporting goods to fill out the declaration forms). 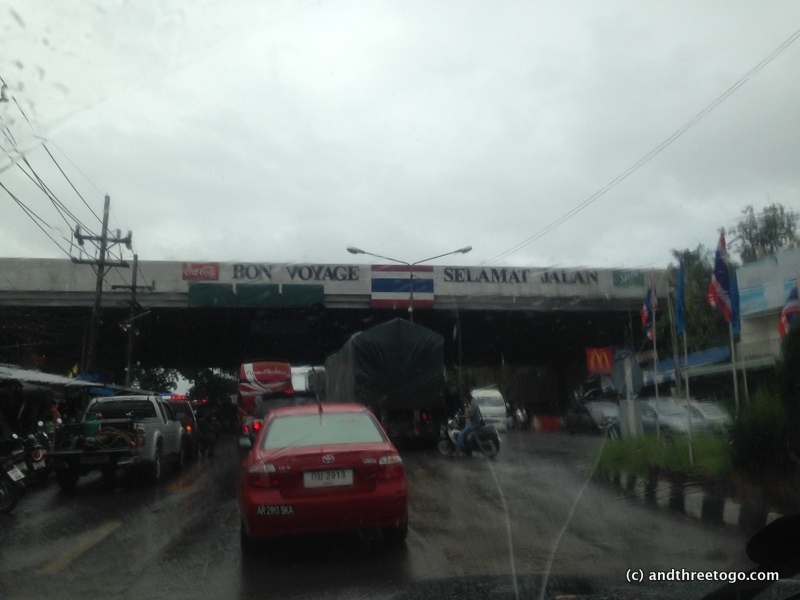 Return to the AH2 Highway, and in a kilometer or two, you will see the Thailand border. Drive through the border and pull into the parking lot on the right. Park. Make sure to lock all your doors. Make sure to bring your passports! Walk to the Passport Control Booths which are across the road that you just drove through. Wait in line and get stamped out of Thailand. Once you are stamped out, return to your car. Exit the parking lot using the same driveway that you entered. Drive to the Malaysian border (if you want to buy some Duty Free goods, there are stores between the borders that you can stop and get them at). Drive up to the Passport Control booth, the lanes for different types of vehicles are clearly marked. There is a charge to enter the country, 3.60 Ringitt for private passenger vehicles. Give your passports to the person at the window, there is no need to get out of your car. Drive on for a moment. The Malaysian Border Patrol will stop you and take a quick gander at your car. They just looked into our windows, but others were having their car searched. Immediately after the border crossing, there will be a Tourist Information building on the left. Stop and park there, if you have not already gotten Malaysian car insurance or Malaysian license plates (Thai plates have two Thai letters followed by 4 numbers, the Malaysian plates are just the Thai letters translated into English and the 4 numbers). Across the street there are two tents where they sell Malaysian insurance (we paid 104 Ringitt, about $32 USD, for a month) and they can also sell you Malaysian plates that are really just bumper stickers that go on the front and back bumpers. You MUST have both of these things to drive in Malaysia! You are now free to drive in Malaysia and continue on your way! Make sure to know what the traffic laws are in Malaysia and drive safely! Have a wonderful time in Malaysia! If you have any comments or know of any changes in the border crossing procedures from what I have written here, please leave a comment and let me know. This page is current and correct as of October 1, 2014.